I wonder what the scoop is on Disney’s influence on Tim Burton’s vision for Alice in Wonderland. I haven’t heard a thing about it either way, but it certainly feels like someone shoehorned a good Tim Burton idea into an old Disney boot. I don’t like the practice of combining two existing works (Alice’s Adventures in Wonderland and Through the Looking Glass, in this case) and presenting something new from it. In most cases – as in this one – it ends up falling short of communicating the magic of either of the individual works, while also failing to invent much new magic. The filmmakers do not disappoint on every level, though. 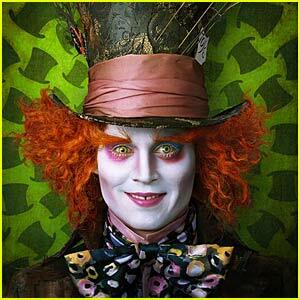 The performances across the board are very good, highlighted especially by Mia Wasikowska (Alice), Johnny Depp (the Mad Hatter) and Matt Lucas (as both Tweedledee and Tweedledum). It really is wonderful to see some of these classic characters brought artfully to life by talented actors. Most of the digital effects are impressive or at worst not distracting, and quite a few scenes manage to capture some of the mystery of the Alice books with a touch of the classic Burton darkness. But the twisted, exciting visuals of Burton are marred by conventional plot developments. And Danny Elfman’s music, often underestimated as the partner to Burton’s images, lacks its usual delighted creepiness. By the end, there is just too much “here we go again” in a world that is supposed to be anything but predictable. We have now seen so many amazing images and fantasy worlds that critical standards for visually-driven movies are increasingly higher. Avatar is still in theaters, and the past decade has shown us The Lord of the Rings, Harry Potter, all of the comic book superhero movies and the ancient history adaptations like Troy and 300. There is hardly a mythic creature or super power that we haven’t yet seen. The first scenes work. Alice finds herself caught in a room with several doors. None of them opens until she discovers a key that opens a very tiny door near the floor. After experimenting with an elixir and a cake (labeled “drink me” and “eat me”) she finds that, depending on which one she eats, she changes sizes. Upon finding the right combination of shape-changes, she runs through the door and discovers Wonderland. She is met immediately by Dormouse, Tweedledee and Tweedledum, the White Rabbit and Absolem (a smoking, talking blue caterpillar, voiced expertly and amusingly by Alan Rickman). There is great promise in these scenes. They hint at something bigger, anticipating an adventure. What follows is a series of charming moments and anti-climaxes. Some of the finer moments include scenes with the Chesire Cat, a genuinely funny March Hare and the croquet scene (where the Red Queen uses a flamingo as a mallet). But most of the storyline about the rivalry between the Red and White Queens is vague and stale, and the movie’s supposed climax, Alice’s battle with the Jabberwocky, is forced. Overlaying the more interesting smaller scenes is an idea that Alice is supposed to “find herself”. She must recover her “muchness” (as the Hatter puts it) and, apparently to prove this, she must slay the Jabberwocky. This is a strange direction for the story. It is a significant departure from the original story and does not seem to match the themes or tone of the rest of the movie. I also think that it isn’t necessary. As stupid as some movie executives think the audience is, I don’t believe that many people wanted or expected an explosive, closing action sequence from Alice in Wonderland. Afterward, Alice returns home and, as in many happy “So there!” movie endings, walks up and down the line of her real world “oppressors” and tells them what she really thinks of them. Screenwriter Linda Woolverton or Tim Burton must surely have been heavily influenced by Disney guidelines when creating this finale. I can’t say that I disliked the movie, though. The performances alone make the film worth a watch, and most of the rest of it is passably entertaining. The one exception is a quite awful moment at the end when the Mad Hatter performs a dance to the beat of an anachronistic hip hop-like tune. I dearly hope that this was not Tim Burton’s idea. This entry was posted on March 14, 2010 by Ian Kay. It was filed under Alice in Wonderland (2010) .